4. Dress: Rachel Parcell // 5. 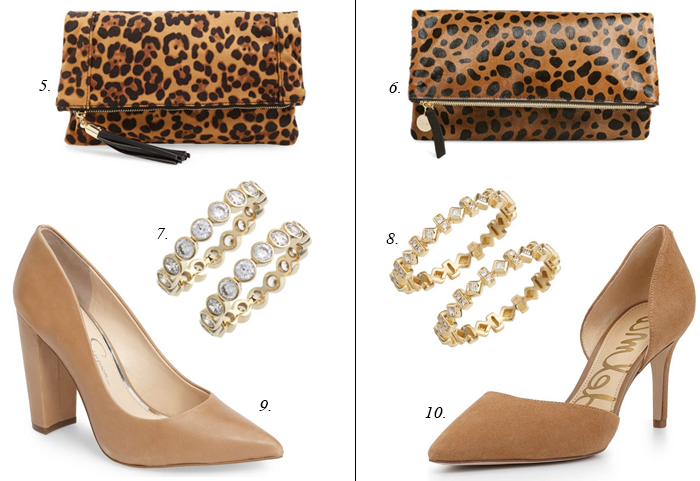 Clutch: Nordstrom // 6. Clutch: Clare V.
This v-neck sweater comes in grey and black and is under $40. These popular Tory Burch sandals are marked down 40%. This cardigan is on sale for only $22. These blush velvet booties are going to be really popular this fall - and they are marked down 33%. I love these velvet leopard slip on sneakers. This pink scarf that is only $18 - would be perfect this fall and winter. I bought this sweater - and now I want to buy it in orange and grey). These brocade slip on loafers are only $30. This crewneck sweater is $13 and comes in six colors. This cozy sweatshirt is $13 - and comes in different colors. Both of these looks are so fabulous! I can't believe how identical the save look is. Great job. What an elegant and pretty look. Love it! You always find the best deals. What I love so much about these posts is I usually like the "save" column better than the "splurge!" You find some great pieces!